^ Ghost of Fun Time's Past. Linux Journal. ^ Zimbinski, Bob. Getting Started with Quake. Linux Journal. January 1, 1999. ^ Partnership with Crack dot Com Brings Games to Linux (新闻稿). Red Hat. 1997-10-07 [2014-07-31]. ^ So Long, Crack.com. loonygames. [2011-08-04]. ^ 'Dave Taylor Interview - game developer'. blankmaninc.com. 2012-10-27. ^ Mrochuk, Jeff. How To Install Quake 1. Linux.com. November 15, 2000. ^ History and Future of OLPC SimCity / Micropolis. [2016-02-27]. （原始内容存档于2016-01-13）. ^ Kuhnash, Jeremy. Hopkins FBI]. Linux.com. February 9, 2000. ^ Hitchens, Joe. Internet Based Software Development. Sleepless Software Inc. September 19, 2001. （原始内容存档于2001年12月31日）. ^ Ultima Online for Linux. （原始内容存档于2004-02-29）. ^ Interview: Scott Draeker and Sam Latinga, Loki Entertainment. Linux Journal. August 1, 1999. ^ Interview with Ryan Gordon: Postal2, Unreal & Mac Gaming – Macologist. （原始内容存档于2005-03-09）. ^ Kreimeier, Bernd. The Story of OpenAL. Linux Journal. January 1, 2001. ^ Hills, James. Loki and the Linux World Expo – GameSpy chats with Linux legend Scott Draeker about the future of Linux gaming. GameSpy. （原始内容存档于2006-03-15）. ^ Linux Game Publishing Blog, LGP History pt 1: How LGP came to be. （原始内容存档于2011-07-13）. ^ Larabel, Michael. Alternative Games Is All About Linux Gaming. Phoronix. December 14, 2010. ^ Heggelund Hansen, Robin. Porting games to Linux. hardware.no. 2009-03-10. ^ Quake, Meet GPL; GPL, Meet Quake. Linux Journal. 2007-12-01 [2012-01-12]. ^ 22.0 22.1 The State of Linux Gaming 2011. OSNews.com. 2011-11-14 [2012-01-12]. ^ Orland, Kyle. GDC 2011: Humble Indie Bundle Creators Talk Inspiration, Execution. Gamasutra. 2011-02-28 [2011-02-28]. ^ Sneddon, Joey. Linux Users Continue To Pay Most for the @Humble Indie Bundle. OMG! Ubuntu!. 2011-12-21 [2012-01-12]. ^ cheese talks to himself – Desura Beta. twolofbees.com. 2011-10-11 [2011-11-07]. ^ 26.0 26.1 The state of Linux gaming in the SteamOS era. Ars Technica. 2015-02-26 [2015-02-27]. 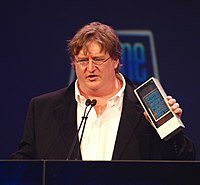 ^ Gabe Newell: Linux is the future of gaming, new hardware coming soon. Ars Technica. 2013-09-16 [2015-02-27]. ^ Albanesius, Chloe. Valve Moves Forward With Steam for Linux | News & Opinion. PCMag.com. 2012-07-17 [2014-03-18]. ^ Steam’d Penguins. Valve Corporation. 2012-07-16 [2012-07-16]. ^ Lein, Tracey. 'Left 4 Dead 2' to be first Valve game on Linux. The Verve. 2012-07-16 [2012-07-16]. ^ Hillier, Brenna. Serious Sam 3: BFE headed to Steam Ubuntu. VG247. 2012-07-24 [2012-07-24]. ^ Larbel, Michael. Valve's Linux Play May Lead More Games To Follow Suit. Phoronix. 2010-05-25 [2012-10-29]. ^ Larbel, Michael. Egosoft Wants To Bring Games To Steam On Linux. Phoronix. 2010-11-18 [2012-11-25]. ^ Editorial: Linux Gaming Will Be Fine Even Without Steam Machines Succeeding. GamingOnLinux. 2015-02-20 [2015-02-27]. ^ Unity 4.0 Launches. Marketwire. 2012-11-14 [2013-04-03]. ^ 原 文："As we've been working on bringing Steam to the living room, we've come to the conclusion that the environment best suited to delivering value to customers is an operating system built around Steam itself." ^ Makuch, Eddie. Valve reveals SteamOS. GameSpot. 23 September 2013 [25 September 2013]. （原始内容存档于2013年9月26日）. ^ Steam Machines: Valve Announces New Living-Room Hardware That Runs SteamOS. Web Upd8. 2013-09-25 [2014-08-04]. ^ GOG.com Are Going To Support Linux, Confirmed!. GamingOnLinux. 2014-03-18 [2014-03-18]. ^ GOG Com Now Officially Support Linux Games. GamingOnLinux. 2014-07-24 [2014-07-24]. ^ Unreal Engine 4.1 Update Preview. 2014-04-03 [2015-12-18]. ^ CRYENGINE adds Linux Support as Crytek Prepare to Offer New Possibilities at GDC. 2014-03-11 [2015-12-18]. ^ GamingOnLinux Interviews Feral Interactive About XCOM & Linux Game Development. GamingOnLinux. 2014-06-26 [2014-08-04]. ^ Interview With Aspyr Media About Civilization V & Linux Gaming. GamingOnLinux. 2014-07-23 [2014-08-04].